Four foreign-based players including young sensation, Henry Adjei-Darko,and four home-based stars have been named for Ghana's Euro-Africa Davis Cup tie against Finland early next month. Adjei-Darko will lead the Golden Rackets team that comprise the likes of Salifu Mohammed, Daniel Omaboe, Guther Darkey who have been invited by the Ghana Tennis Association (GTA) for the March 4-6 match in Accra, while their local counterparts Fred Egyir, Michael Nortey, Emmanuel Mensah and Owusu Menford have begun training under coach David Churcher at the Ohene Djan stadium. According to coach Churcher, Darko,Mohammed,Omaboe who are all based in the United States and UK-based Darkey , are expected in the country by Sunday. Coach Churcher told the Graphic Sports last week that the Golden Rackets were fired up to beat their opponents on account of the advantages they stand to enjoy in this clash. “The players are ready for the Davis Cup, this is what they have been waiting for,”he said even the local players are in perfect shape, given the form they had shown at training. Mensah and Menford won gold medals in the doubles at the ITF Junior Circuit for Central and West Africa in Togo last month, while Mensah again won silver in the singles at the same competition. Apart from the hot weather the Eastern Europeans are certain to encounter in Accra, they would miss their preferred clay surface on which they triumphed over Ghana about a decade ago in a similar clash. That notwithstanding,Finland is coming to Ghana with a team far more experienced and highly ranked on the International Circuit. Finland's top seed,23-year-old Jarkko Nieminen, is 77th in the world ranking, while Zire and Louri are 505th and 604th respectively.Tun, one of their stars, was ranked 221three years ago. 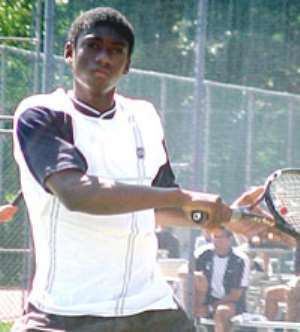 Adjei-Darko is Ghana's current best player on the Circuit, ranked 575th in the world, while Mohammed is 1079th. The two other foreign-based stars,Omaboe and Darkey,have not currently in the ITF ranking, reportedly due to relatively inactivity on the Circuit. Coach Churcher said he was optimistic the players would put up a good performance.